The worst outbreak of the deadly Ebola virus in history is threatening to spread out of West Africa and affect countries further afield. The first case was reported in Guinea on March 22. Spanish authorities have granted citizenship to two African missionaries, Paciencia Melgar Ronda from Equatorial Guinea and Helena S. Wolo from Sierra Leone, who helped to save the life of Madrid-based nurse Teresa Romero. Ronda recovered from Ebola after contracting it in Liberia, travelled to Madrid and gave her blood plasma to Romero. Wolo also donated her blood plasma to the Madrid nurse. Doctors say Ronda’s and Wolo’s help ensured Romero’s recovery. The United States is adding Mali to the list of countries whose travelers get special Ebola screening after a number of cases in the West African nation, the government said on Sunday. Enhanced screening will start on Monday for the 15 to 20 travelers who arrive daily from Mali, the U.S. Centers for Disease Control and Prevention and the Department of Homeland Security said in a statement. Russia has sent two military An-124 transport planes to Guinea to deliver field hospital equipment and medicine, a spokesman for the Defense Ministry told journalists. The cargoes are meant to help the West African country fight against the Ebola outbreak. The hospital is capable of treating up to 200 patients and has resources for autonomous operation, he added. Martin Salia, a surgeon from Sierra Leone who is critically ill with the Ebola virus, has arrived in the United States from West Africa to be treated at a Nebraska hospital, medical officials said. His condition is reportedly worse than previous patients treated for the disease in America. The 44-year-old, who has permanent US residency, contracted the virus when he was working as a surgeon in a Freetown hospital. He was admitted to Nebraska Medical Center on Saturday. The Ebola outbreak in West Africa has now claimed 5,147 lives, the World Health Organization announced on Wednesday. According to its latest statistics, more than 400 new infections were reported in Sierra Leone during the week leading up to November 9, but the outlook in Guinea and Liberia is a little more hopeful. "There is some evidence that case incidence is no longer increasing nationally in Guinea and Liberia, but steep increases persist in Sierra Leone," the WHO said in a statement. "Cases and deaths continue to be under-reported in this outbreak." The vast majority of cases and fatalities have been reported in West Africa. Elsewhere around the world – in Nigeria, Senegal, Mali, Spain, and the United States – 13 deaths and 30 cases have been identified. The first person in New York City to be diagnosed with Ebola, doctor Craig Spencer will be released from Bellevue Hospital Center on Tuesday, the New York Times reported. The 33-year-old doctor’s release has not been officially confirmed, but two unnamed sources “familiar with his treatment” told the newspaper it will be happening. First diagnosed on October 23, Spencer came to the attention of healthcare workers when he reported a fever of 100.3 degrees. When the Ebola infection was confirmed, it sparked a significant response from New York City as well as the state, with disease detectives from the Centers for Disease Control and Prevention rapidly tracking down his past movements and interviewing people he came in contact with. Once it is declared that the doctor no longer has the virus, Spencer’s release will mark the first time the United States has been Ebola-free since Liberian man Thomas Eric Duncan was diagnosed with it in late September. A UN employee who contracted Ebola while working in Sierra Leone has been evacuated to France for treatment, reports AFP. The UN worker has been placed under isolation in a high security military training hospital near Paris, where a French nurse who contracted the virus in Liberia recovered earlier this autumn. 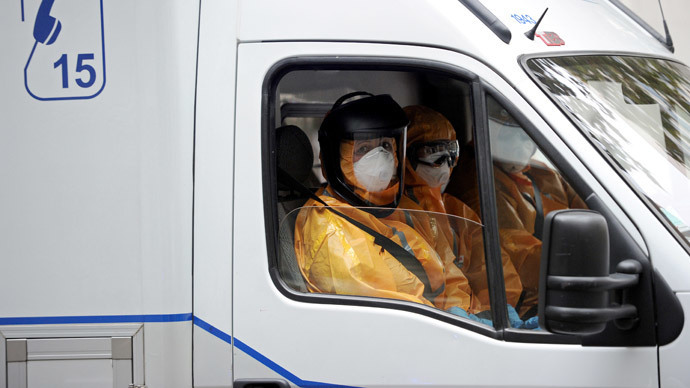 Though there have been about 500 reports of possible Ebola infections in France since June, none have tested positive. France has 12 research hospitals equipped to deal with Ebola cases. Ebola’s toll on Sierra Leone could be much greater than previously thought, with entire villages killed off by the virus. This means up to 20,000 people could have succumbed to the disease by now, a senior coordinator for Doctors Without Borders (MSF) told AFP. The Spanish government said it is concerned that terrorists of the Islamic State (formerly ISIS) could use the Ebola virus as a biological weapon against the West. A close eye is being kept on online chat rooms, where such attacks are said to be discussed among jihadist groups. Dallas nurse Nina Pham, who has recovered from the Ebola virus, left the hospital and was finally reunited with her dog Bentley on Saturday. The dog spent the last three weeks in quarantine while being monitored for the deadly virus, until doctors determined that he was also free of the disease. Nina Pham caught Ebola while caring for Thomas Eric Duncan, the first person to die from the disease in the US. She was sent to the National Institutes of Health in Maryland for treatment before being released on Oct. 24. Meanwhile, Bentley was isolated and cared for by Dallas Animal Services workers who petted and played with the dog while wearing protective suits. Bentley received a third negative test for Ebola on Thursday.